The Mediterranean diet is consistently ranked as one of the world's healthiest diets. It is a holistic and natural approach to weight-loss, disease prevention and treatment, and anti-aging. Never has the Mediterranean lifestyle been more accessible to you than through this audiobook - a practical approach to the Mediterranean diet. The ultimate tool for your busy lifestyle. 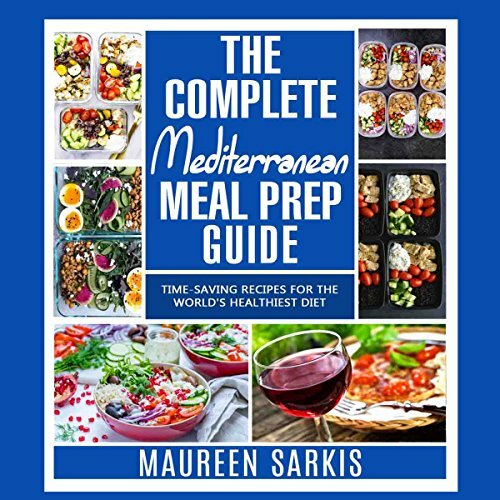 Meal prepping meets the Mediterranean diet: This book will teach you how to transform your eating and cooking schedule. It will show you how to plan and prepare all your meals in advance so that you don't have to spend every night in the kitchen. Rich in healthy fats, fruits, vegetables, grains, and foods full of natural vitamins and antioxidants with no processed sugars or refined grains or oils. Light but hearty Mediterranean breakfasts like: Slow-cooker breakfast quinoa with blueberries. Packable lunches to take to work like: Zesty Greek tacos. Mouthwatering dinner recipes like: Caprese-stuffed chicken breasts. Meal prepping is the best way to ensure that you will stick to your diet and to make sure your diet fits your lifestyle, not the other way around. These recipes will save you hours of time in your busy week, plus arm you with an eating and cooking plan that will help you exceed your health goals. Well, I have found answers to some of my questions about this Mediterranean diet plan. Personally, I like seafood, so many of these recipes look tempting for me. I guess Mediterranean lifestyle is beneficial for general health since it is relaxed enough. This is a very practical, very easy to follow book with great photos and recipes with all the ingredients very clearly marked. I loved it and am looking forward to making several of the recipes that I read about. It also gives a good explanation of what the Mediterranean Diet is and why it is good for you. I loved it and I recommend it to anyone who is looking to eat healthier.